If you're about to head into the jungle in a team of four, it's always an encouraging sign when you're all surprisingly good at blowing poison darts at a hanging coconut target. This was not a skill I knew I possessed, and I'm pretty sure Colin, Rob, and Andrew weren't aware they possessed it either. But let's get serious: tonight we were given our first chance to try, and we nailed it. Today we left Kuala Lumpur, said goodbye to our beloved KL guide, Shanti, and boarded a quick flight over to Kota Kinabalu, a smallish city on Borneo. After dumping our bags at our hotel, we headed out to the Mari Mari Cultural Village a little ways out of town, and spent the night climbing up and down bamboo ladders into the traditional longhouses of the Borneo tribes, learning how to make rice wine, coconut cookies, singing, dancing, making fire, and yes—attempting the blow gun. “Mari mari” means “come, come”, and unlike a museum or gallery, this village is trying to preserve indigenous skills and rituals by making them a completely immersive, interactive experience. Also unlike a museum, the information here completely sticks in your head. You wander through each longhouse, observe a traditional skill, and then try it out yourself. Everyone in the village wears paint, feathers, and colours, and they're grouped into Borneo's different tribes. One of the these is a headhunting tribe, and their longhouse had a truly amazing feature—a big rattan trampoline streched over a square depression in the wooden floor. When a tribesman would return home with the severed head of an enemy, the chief would hang a prize from the ceiling a good 30 feet off the floor. The tribesmen would start jumping on the rattan trampoline until the head-bringer-homer got enough momentum to get high enough and grab the prize. The chief gave us a demonstration that belonged in the turbo NBA, and then invited Colin and Andrew to test it out. No one on Borneo really lives in longhouses anymore—at least not the original kind we saw tonight—but Mari Mari was an informative, quirky place to visit. We came away with a bunch of useful practical knowledge, like how to use bamboo shoots to start a fast fire but also the fact that this is much harder than it appears and that yes, one of us did pack a Zippo. I liked Kota Kinabalu immediately. It feels like Kuala Lumpur's scrappy younger brother. It's smaller, more relaxed, and a bit less polished, with brightly coloured store signs scattered along the hazy shore of the South China Sea. Kuala Lumpur seems enamoured of the future—progressive transit, bold architecture, blossoming tourism—whereas Kota Kinabalu seems more zen somehow, content, not in as much of a rush. The conversation in the car on the way in from the airport says it all: we started noticing a lot of older minivans on the road that seemed to be from the '90s, and pretty soon our own van was filled with breathless nostalgia as we listed the bands, weird snack foods, formative albums, and inexplicable fashion choices of our elementary and high school years. That's how Kota Kinabalu feels—familiar, comfy, unpretentious. Your last sweet moments in sneakers before you begrudgingly move to high heels. Nov. 19, 2013, 3:30 p.m. In Kinabalu National Park, in the state of Sabah, there are no traffic jams or honking horns, only the continuous animal and insect sounds emanating from the dense tropical forest. Up above the tree line rises the 4000 metre summit of Kinabalu, the highest mountain in the region. I've run out of exclamation marks to express how beautiful this park is. No wonder it was designated a UNESCO World Heritage Site, the first of its kind in Malaysia. Our guide Augustine says that Kinabalu is one of the main attractions for visitors to Sabah (along with scuba diving). It's a 2 day climb to the top and back and must be done with a guide (200 people max can summit per day based on the capacity of the lodge system in the park). Of course, skyrunners can make the 18km round trip in about 3-6 hours, if they've got the legs and lungs for the job (Kilian Jornet, the great Catalan runner, knocked it off in a staggering 2hrs 11min in 2012). But not everyone comes here to see how fast they can complete the route. Nature enthusiasts are drawn to the park's flora and fauna, which are of staggering proportions (over 5000 species of plants and 300 species of birds call this park home). I cast my eyes longingly to that rocky summit, but alas a chance to view Sabah from the top is not to be. Instead, I will satisfy myself with a walk in the woods below. Note to self: come back soon and walk/run to the top of this spectacular mountain! Nov. 19, 2013, 11:03 a.m.
Kuala Lumpur is no longer just a transit point but a destination for travellers. In recent years, it has become a top ten urban destination in Asia, with a focus on luxury travel, cultural tourism, and a duty free haven for those with shopping on the brain (CNN Travel ranks Kuala Lumpur the 4th best shopping city in the world). More proof that Kuala Lumpur has thoroughly embraced its modernity is the KLIA Ekspres, which is a dedicated high speed train (160km/hr) from downtown Kuala Lumpur to the international airport, including baggage check-in before boarding the train. That puts them way ahead of most North American cities for airport transit. Next we took off to the Kuala Lumpur Bird Park, one of the world's largest enclosed bird sanctuaries. How do they keep thousands of birds from escaping, you ask? Giant mesh canopies held up by massive support beams through-out the park. So we walked around the park, sweating in the jungle-like humidity, captivated by the exotic wildlife. And with that, our time in Kuala Lumpur is coming to a close. Tomorrow we fly out to Borneo and there pickup the trail of our red-haired cousins, the orangutans. Nov. 18, 2013, 5 p.m.
Kuala Lumpur sleeps outside my window, but I'm awake, my stomach growling. It's 2:30pm back in Toronto, and my body is saying, "you missed lunch!" It hasn't figured out yet that I'm in a new time and place. My head is already full of new impressions. When we got to the lavish Prince hotel, our team broke off to our own rooms to organize gear and refresh after the 24 hour journey. I worked in a kind of slow-mo, as if I was unpacking my bag under water. The shower helped revive me somewhat, but it was really the streets of KL that woke me up, moving with the bustling crowds and dodging the stop-and-go traffic. For a time, we wandered the neighbourhood surrounding our hotel, soaking up the warm humid air, passing through an upscale mall with its restaurants and bars. We kept going to see what else the neighbourhood offered. There were local eateries selling halal meats beside the 7-Eleven. The streets were shared by groups of young people in shorts, as well as women in full hijab. It felt as if the whole world was represented along these sidewalks. But it's now 4am, and my stomach is seriously calling for me to feed it—so I must abide. Wow, what a day! We really packed it in. I want to focus a bit on the architecture and the celebration of cultural fusion that makes KL such an interesting place to visit. 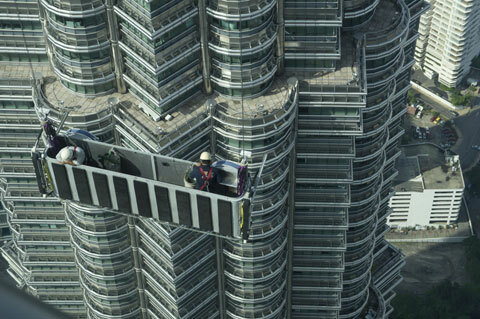 First off, Kuala Lumpur has fearlessly embraced bold modern architecture. Their skyscrapers possess curving lines that flow effortlessly into the sky. Perhaps our city guide, Shanti, who is Hindu, summed up the secret to Kuala Lumpur's success when she told me how her sister married a Muslim man and her brother married a Christian woman. This city doesn't seem to guard its cultural influences. It shares them. Still, the cultural ties to traditional homelands remain strong, whether it's the Chinese architects and craftsman brought in from China to build a traditional Chinese building, the Indian business people who built Little India and continue to import the latest fashions from Pakistan and India, or the mosques that dot the city with their inspired Islamic motifs. This is clearly a city on the rise, a city not afraid to celebrate its global influences. One of my favourite stops on today's tour was the Batu Cave temples nestled into a series of impressive mountains that jut from the earth on the outskirts of Kuala Lumpur. Seeing the 42 meter high golden statue of Lord Murugan at the base of the holy site, I knew we were in for something very special. The climb up nearly 300 steps was rewarded ten fold upon entrance to the Batu Caves temple complex. Beneath the arching ceiling of the aptly named Cathedral Cave, which is hundreds of millions of years old, a Hindu temple draws many religious devotees. The Hindu temples and shrines find a profound harmony with the ancient cave, with its stalactites that resemble melting candles dripping from the ceiling. 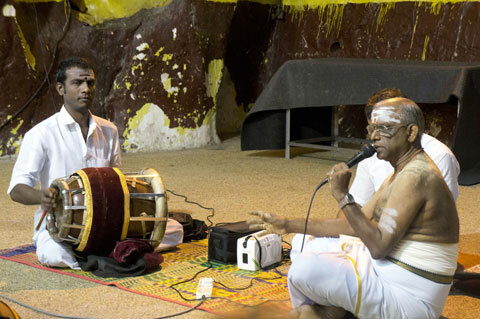 All the while, the giant cavern was filled with the sound of Hindu musicians singing and playing tabla. A melodic finish to a great day of exploration. Nov. 16, 2013, 2:31 p.m.
25 hours in the air isn't so bad when you're sitting beside three seasoned travel junkies each bursting with stories of their roughest treks, their highest peaks, their freakiest diseases. My Mad Men Season 6 Binge-a-thon didn't hurt, either. Still, when we finally felt the wheels touch down in Kuala Lumpur, there was definitely an attempt at a logistically unsound four-way-high-five. Our guide Shanti and her husband met us at the arrivals gate. 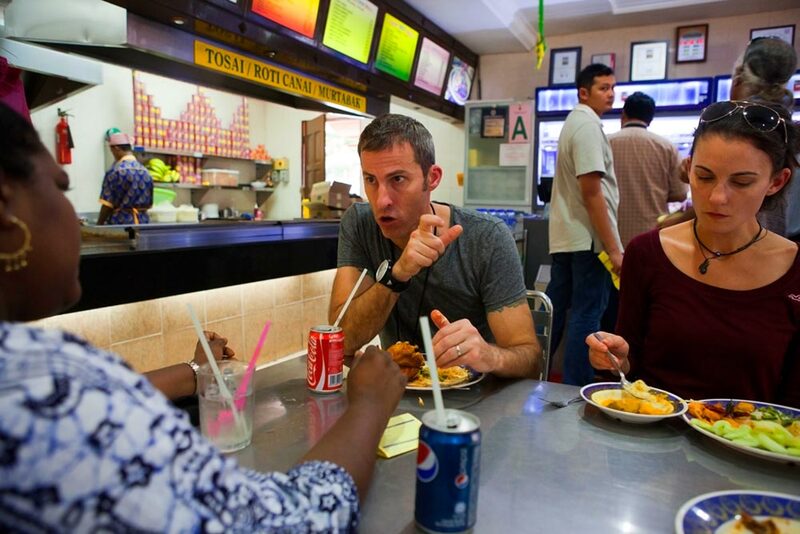 Shanti's first question: Do you guys want Malaysian food? Obviously the answer to this question will never not be yes, and so we climbed into her van and began the drive into Kuala Lumpur. We caught a glimpse of the Petronas Towers from afar, which we'll be exploring tomorrow, and colourful Islamic minarets set against a backdrop of endless palm trees. After about an hour, Shanti pulled over and we ducked into a huge open-air street food tent. It was bustling and hot, with bright crimson sauces simmering in enormous vats and fish heads peering up at us. We loaded our plates with spice and colour. Shanti smiled and reminded us to use the proper hand. You're expected to eat with your right hand, and reserve the left for more... toiletish matters. Shanti explained that Malaysia is a mix of Chinese, Malay, Indian, and indigenous cultures, and a quick glance around the food tent seemed to perfectly illustrate this. A couple of guys behind the counter sweated it out in front of a tandoori oven, while a group of monks walked past our table. I'm hoping we might stumble across the opportunity to observe and learn some traditional Malaysian cooking techniques at some point in our journey. Nov. 15, 2013, 10:24 a.m.
We're still dressed for a Toronto November but we can feel the humidity creeping in from the outside. It's 6 am and 6 pm simultaneously. We're all a bit groggy after our long haul flight, but sufficiently caffeinated and collectively excited for the adventure ahead. After landing in Hong Kong, we hunted down the only airport restaurant open at 6 am – a noodle house that served up generous bowls of steaming laksa soup, which is a coconut and curry broth sent directly from heaven, especially following a 15-hour flight. Because our flight landed in darkness, it took about an hour before we realized the enormous hulking mountains directly outside the airport's window. It wasn't until the sun rose that we stopped feeling like we were hanging out in a nondescript airport and started feeling happily far from home. The sunrise was fast and dramatic, silently exploding over the tail of our plane, and almost immediately it united everyone in our waiting lounge as we all watched a new morning arrive. Nov. 15, 2013, 10:21 a.m.
Well, we've been flying through the night for over 10 hours, having left Toronto at 1:25am. Our flight path heading west and north over top of the globe means we've been tracking the darkness all this time. At some point, though, we will no longer be going back in time but will cross the time line that puts us 13 hours ahead of Toronto. Kind of mind boggling, actually. We're flying Cathay Pacific, which means we are stretched out and comfortable for the 21 hour journey to Kuala Lumpur, Malaysia. There is so much to look forward to on a trip like this: trekking in the jungle, seeing Orangutans in their natural habitat, meeting new people along the way, and the food, of course! Our 4 person team is super talented and well travelled, so I'm really excited to share and learn from them over the next two and a half weeks, as we explore the many wonders of Malaysia. So as we fly south over China, still enveloped in darkness, I feel that the adventure is just ahead on the horizon. Nov. 14, 2013, 6:11 p.m.
Our merry band of four is hanging out at our gate at Pearson, waiting to board our flight over to Kuala Lumpur. We're comparing hiking boots, rain gear, and some pretty slick strategies for outsmarting jungle leeches. Flying late at night is a beautiful thing. It's such a welcome change from the typical rushed, early morning madness most of us often associate with travel. We all got some quality time in with our families tonight, dinners and goodbyes, and our van sped through dark, nearly empty highways en route to the airport. Pearson feels a bit deserted at midnight, or at least it did tonight. Our lounge is filled with people drowsy and dozing all around us, but our excitement has kept us chatting and laughing and buzzing as 1 am approaches and the boarding line slowly starts to form. 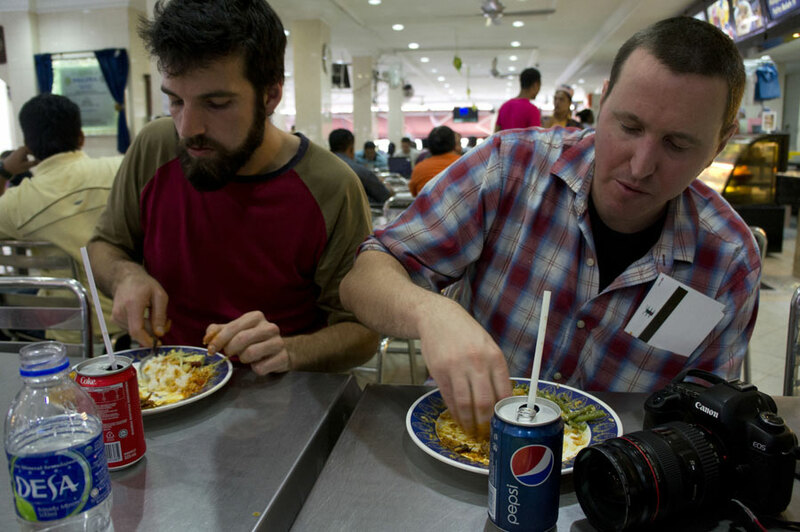 We'll be spending our first few days in Kuala Lumpur, exploring markets and mosques and discovering the city on foot. Nov. 14, 2013, 9:59 a.m.